Kilmarnock may have failed to give new manager Lee Clark the win he craved in his first match in charge – but his glass was half-full afterwards as he chose to accentuate the positive. The Ayrshire club remain in the Premiership relegation play-off position, behind Partick Thistle on goal difference, but Clark believes that progress is being made. Kilmarnock face an awkward trip to Tynecastle on Saturday but, with a full week in which to work with his players, new man Clark is ­convinced that he can speed up the rate of that progress. He said: “There was a lot for me to be happy with and I think we deserved to have gone in front at half-time. “We created some decent opportunities and we certainly deserved to take something from the game. The application of the players, the desire, the tempo and the quality of the football were pleasing. Clark almost got off to the perfect start when Josh Magennis outmuscled Paul McGinn to latch on to a loose ball in the third minute. The Irishman was left with only the goalkeeper to beat but the angle was acute and, although he squeezed his shot behind Scott Bain, Kevin Holt was alert to the danger and cleared off the line. Central defender Conrad Balatoni then fired just over from Kevin McHattie’s low, driven corner in the 20th minute as the visitors – 4-0 winners here in August – ­struggled to find a foothold in the game. Two minutes later Bain pulled off a remarkable reflex save to prevent Holt from scoring an own goal as the full-back mishit his clearance from Craig Slater’s inswinging free-kick. It required another goal-line intervention, this time from Nick Ross, to keep out Magennis’s header from another McHattie set-piece. Half an hour had elapsed before Dundee threatened and, when Rory Loy got on the end of Greg ­Stewart’s pass, Balatoni threw his body in front of the shot to deflect it over the bar. It was a mere blip, though, as the home side continued to dictate and Tope Obadeyi somehow failed to convert a Magennis flick-on at the near post in the 38th minute. Dundee were more purposeful after the break, though, and full-back Lee Hodson did well to pick Stewart’s pocket just as he was about to pull the trigger. Clark sent on Kallum Higginbotham and Kris Boyd for Greg Kiltie and Obadeyi just after the hour in an attempt to jump start his side’s second half but they were grateful to captain Jamie MacDonald, who threw himself to his left to fingertip away a 20-yard curler from Kane Hemmings in the 73rd minute. Even so, Thomas Konrad really should have won it for Dundee in the last minute. McHattie was cautioned for pulling Loy back and Paul McGowan’s free-kick found Darren O’Dea, who was unmarked at the far post. The former Celt unselfishly picked out the German, who failed to hit the target with a free header from six yards. Manager Paul Hartley was ­content with a share of the spoils, however, which moved Dundee two points clear of seventh-placed Inverness. 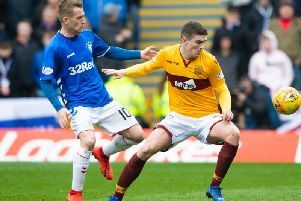 Now, though, he’s looking ­forward to Tuesday’s Scottish Cup fifth round replay against Dumbarton, with the winners due to face ­Rangers at Ibrox in the quarter-finals. Hartley said: “That’s another clean sheet for us, the third on the trot. We haven’t had many but we’re starting to build them up now. “Darren O’Dea has really steadied the ship since he’s come in, with his experience and his communication and organisation. “That had been one of our problems. We had been really good going forward but we were a little bit vulnerable at the back. “But it’s another point on the road and it takes us closer to where we want to be. “However, our only focus at the moment is on Tuesday’s replay against Dumbarton, because we know who we’ll play in the next round.